Value Added Tax, Bank of the Lao PDR, Economic Dispute Settlement, Social Security, Signs, Military Officers of Lao People’s Army, Civil Aviation, Lao Front for National Development, and Veterans’ Federation. The draft laws are expected to be submitted to the 5th ordinary session of the National Assembly which is scheduled to take place in April, according to Government Spokesperson Chaleun Yiapaoheu. “Bringing such a number of draft laws for consideration at the extraordinary meeting of the government reflects that the government attaches greater attention to the rule of law to stabilize the state of people’s democracy,” said Mr Chaleun. 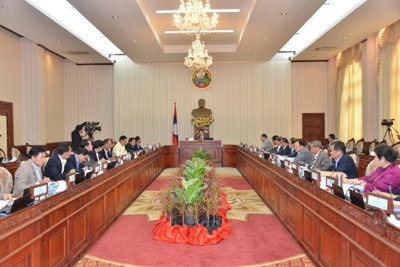 At the end of the meeting, Prime Minister Thongloun Sisoulith urged the cabinet members to attach greater attention to preparing documents to be submitted to the ordinary monthly meeting of the government which will be held this month by making sure they are complete, concise and the preparation is completed timely. He urged officials, Party members, civil servants, armed forces and police officers, students, workers, and business people of the public and private sectors, and Lao people of all strata and all ethnic groups to uphold the spirit of national ownership by actively practice their duties stated in the national constitution and the laws and promote the harmony in the national community and fulfill the task of national protection and development according to the principle-based innovation policy of the Party.